Players from Pacific Island nations have called for end of season Test matches to be played in their home countries as part of the code's plans for international expansion ahead of the 2021 Rugby League World Cup. But with the mid-year Denver Test match featuring New Zealand and England kicking off on Sunday, the clash could kick off a new era for international scheduling and locations. All four Pacific nations teams attended a Pacific Test gala day in Campbelltown on Wednesday and backed the possible expansion of the game involving playing hosts. Tongan forward Jason Taumalolo told NRL.com it was only a matter of time before the powerhouse second-tier nation hosted an international fixture. The World Cup squad travelled back to Tonga following the tournament and were overwhelmed by the support. "That's one of many things we're trying to achieve is to get a game over there," Taumalolo said. "There are a lot of Tongan fans in Australia and New Zealand so playing a game back there would only grow the game. "There wouldn't be a spare seat in the house if it were to happen." Samoa is in a similar boat to their Tongan rivals but were able to last hosted a game in Apia during the Four Nations tournament in 2016, which coincided with their 30th rugby league anniversary celebrations. "It was unreal," Samoan prop Sam Kasiano said, after being part of the side that loss to Fiji 20-18. "I think I scored a try that game. It was just awesome to be able to play in front of our people who live in our country. I think it's time to do it again, we love it wherever we play but being at home is something special." The Fijian side hosted Australia in a warm-up last year leading into the World Cup, while Papua New Guinea play host to the Prime Ministers XIII annually and co-hosted last year's tournament in spectacular fashion. 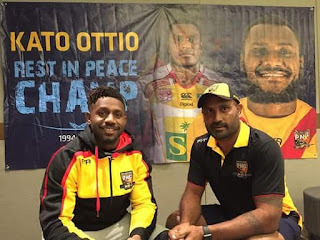 "Playing back in PNG, there is nothing better than pulling on a Kumuls jersey," PNG fullback Justin Olam told NRL.com. "It's the best feeling in the world. We got to do it at the World Cup and the crowd was always packed, people couldn't get in. My family wanted more tickets. It doesn't matter who we play.